As part of our Picture This promotion, we have been showing you some of our favorite photo gifts. Today I would like to share with you the one gift that I get everyone in my family every single year, the Shutterfly Photo Calendar. Every November I start looking back through all of the digital pictures from the previous year and finding ones that represent each calendar month. I then upload them to Shutterfly and start adding borders and text. Within a couple of hours, I have a personalized gift that everyone in my family loves. Can’t pick just one picture for each month? Upload multiple pictures to make a collage. As you start making your gift list this year and checking it twice, be sure to visit Shutterfly and see what kind of photo gifts fit everyone in your life. 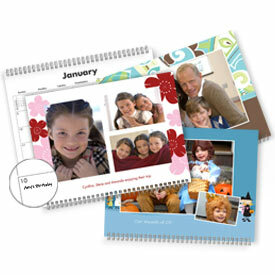 Look for the best coupons for Shutterfly at Sunshine Rewards.